All About Thailand is a new Thai book for kids ages 8 to 12 which brings you on an incredible journey to exotic Thailand. Thailand is a place where a modern culture thrives in one of the world's most ancient countries. Your guides in this adventure are two Thai children: Mali is a 9-year-old girl from the countryside and Tawan is an 11-year old boy from Bangkok. Travel with them as they explore their land--experienced its fascinating wildlife, beautiful handcrafts, sports, games, celebrations and, of course--great Thai food They'll give you a glimpse of what it's like to live in Thailand, and they'll show you all the things that kids in Thailand love to do. Along with fun facts, you'll learn about the spirit of the Thailand that makes this country and its people unique. 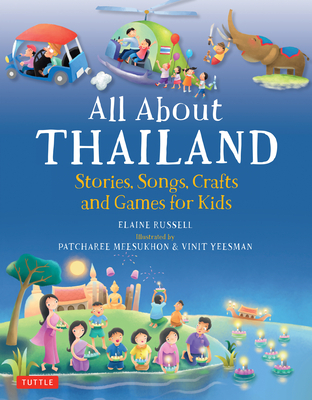 All About Thailand is a book for parents and kids to enjoy together.